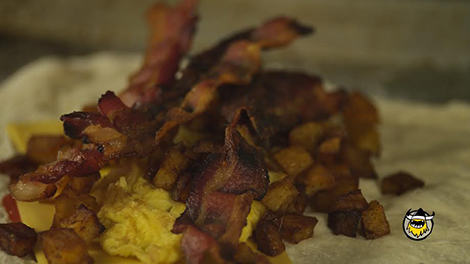 Try your hand at this First We Feast-approved calzone stuffed with fluffy eggs, crispy bacon, hash browns, and cheese. Mornings are stressful, but we’re sure you can do better than grabbing a granola bar on your way out the door. 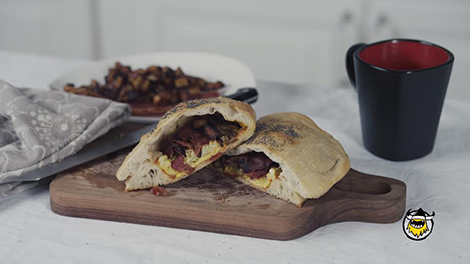 Try your hand at this breakfast calzone that stores all the goodness of a sit-down morning meal—including fluffy eggs, crispy bacon, cheese, and potatoes—in a portable pizza pocket. Watch the full clip to get the calzone recipe and witness mash-up history being made. 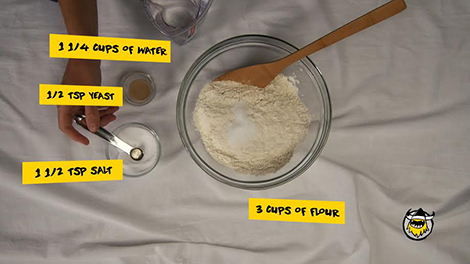 In a large bowl, combine flour, yeast, water, and salt. Cover the bowl with plastic wrap and set aside for 4 to 5 hours. Heat about 2 tablespoons oil in a skillet. 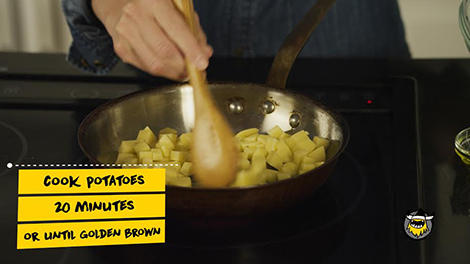 Add in the potatoes and cook for 20 minutes or until golden brown. Next, add the onions and cook until the potatoes become soft. Season with paprika and about a ½ teaspoon salt before setting the pan aside. 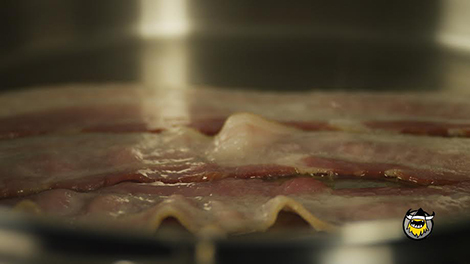 Arrange slices of bacon on a baking sheet in a single layer. Bake at 400°F for 12 minutes until the bacon becomes crispy or heat the bacon in a skillet over medium heat, flipping once. Beat two eggs in a small bowl with a pinch of salt and pepper. Set aside. Heat up a small skillet over high heat for 5 minutes. When hot, film the pan with olive oil before pouring in the egg mixture and turning off the heat. 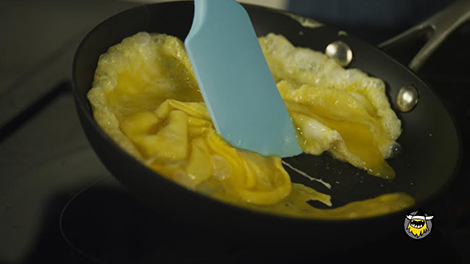 Use a spatula to gently pull the edges of the eggs in, then tilt the pan to get the uncooked eggs back to the exposed part of the hot pan. Repeat until the omelet is soft yet cooked. Fold into thirds and transfer to a plate. Repeat the process for the second two eggs. Preheat the oven to 500°F and divide the dough into two balls on a floured surface. Line a baking sheet with parchment paper before pulling and pressing the dough into a circle on the parchment. Add 2 tablespoons of ketchup and spread across half of the dough. Layer 2 slices of cheese, one omelet, half of the hash browns, and 3 slices of bacon onto the dough, pulling the top to form the calzone. Press the edges together. 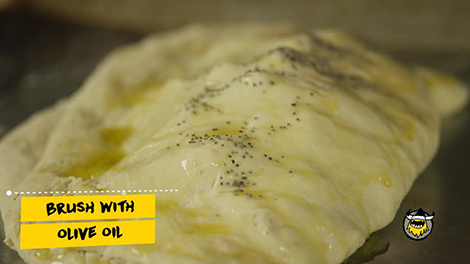 Brush the top with olive oil then sprinkle with poppy seeds. Bake for 12 to 15 minutes until the calzone is golden, puffed, and crispy.